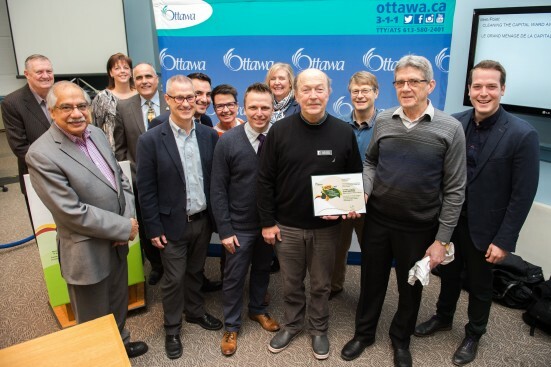 Earlier this year Goulbourn Museum Chairperson Keith Hobbs (holding the certificate) and Richard Czuba from the Kiwanis Club of Manotick accepted the City’s 2017 Cleaning the Capital “Ward Award” which Rideau-Goulbourn won for the greatest participation based on project participants per capita for the spring campaign. Goulbourn Museum is seeking the community’s help to get its site in ship shape for the summer season. The Museum has registered with the GLAD Cleaning the Capital campaign and site cleanup will take place on Tuesday, May 22nd from 10 a.m. to 3 p.m. The rain date is Wednesday, May 23rd. Help will be needed sweeping sidewalks, picking up litter, raking and seeding the lawn, pruning shrubs, prepping garden beds and planting. There will be a supply of plastic gloves but we suggest bringing your own garden gloves if you have them. All cleanup contributions are welcome, even if you can just come for an hour! A pizza lunch will be provided for all volunteers. Goulbourn Museum tells the story of Ottawa’s oldest military settlement. It is located at 2064 Huntley Road, just south of Stittsville, at Stanley’s Corners and is open Wednesday – Sunday from 1-4 p.m. For more information, please visit www.goulbournmuseum.ca, or join the Museum on Facebook for regular updates.